Part 9 of my Top Ed-Tech Trends of 2012 series. On Saturday, I took a ride in one of Google’s self-driving cars. “This will be the most incredibly boring drive ever,” joked the car’s developer Sebastian Thrun. Incredibly boring indeed. I mean, sure, the trip was utterly uneventful: the car cruised along I–280 without incident, just like any Saturday morning drive should go. The other cars did slow and swerve when they saw the Lexus with the Google logo, the little camera on the top, and the words “self-driving car.” Drivers and passengers turned and stared. Amazed. I was amazed. Yes, uneventful, but also was the most incredible drive I’ve ever taken (beating out that time when I was sixteen and a friend and I “borrowed” her stepdad’s Corvette). 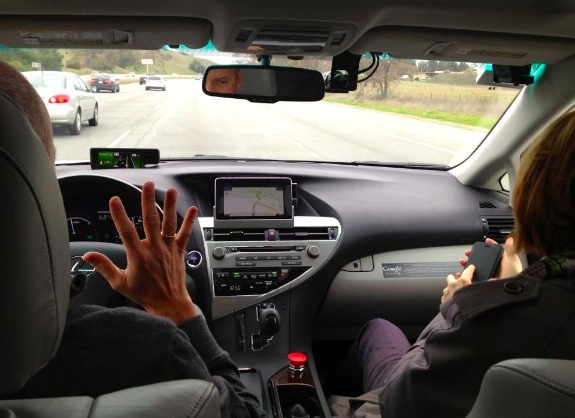 There was Thrun with his hands off the wheel, feet off the pedals, eyes not on the road, explaining how the car (and Google) collected massive amounts of data in order to map the road and move along it. The car does have lots of cameras and sensors, but the technology (hardware at leastI) wasn’t really that overwhelming — the car’s computer quite small, tucked away in the corner of the trunk. It all worked flawlessly. Just another passenger vehicle on the road — how banal. Except that it was driving itself — how friggin’ incredible. I saw the future, in one of those weird William Gibson “the future is already here — it’s just not evenly distributed” moments. I hate to drive and I moved to LA this year: the self-driving car is a future whose more widespread distribution I look forward to. The limo driver that dropped a handful of us off at Thrun’s house, on the other hand, wasn’t so thrilled. But wait, you say. What does the Google self-driving car have to do with education? The lead on Google’s self-driving car project Sebastian Thrun is, of course, also the founder of Udacity, one of the most important education startups of the year and key to 2012’s most important ed-tech trend, MOOCs. It was Thrun’s Artificial Intelligence class offered in the Fall of 2011 that’s often credited for igniting the whole MOOC craze. In January , Thrun announced his departure from Stanford where he’d been a research professor and the director of SAIL, the Stanford Artificial Intelligence Laboratory. Now the director of SAIL is Andrew Ng, who along with fellow Stanford machine learning and AI professor Daphne Koller, is the founder of Coursera. In March, Anant Agarwal announced that he was stepping down as the director of CSAIL, MIT’s Computer Science and Artificial Laboratory in order to become the president of MITx (now edX). The year's three major xMOOC initiatives — Udacity, edX, and Coursera — all originated in AI labs. That’s not a coincidence. That’s a trend. How will the field of artificial intelligence — "the science of creating intelligent machines" — shape education?